Instructions: Cut white cardstock to 8 1/2" x 5 1/2", score and fold at 4 1/4" to create the cardbase. Use the border die from the HCD1-7119 Classic Border Basics to diecut the edge from the side of card. Next, cut a piece of the orange paper from the Beary Fun Retreat paper collection to 5 1/2 x 4 1/4" size. 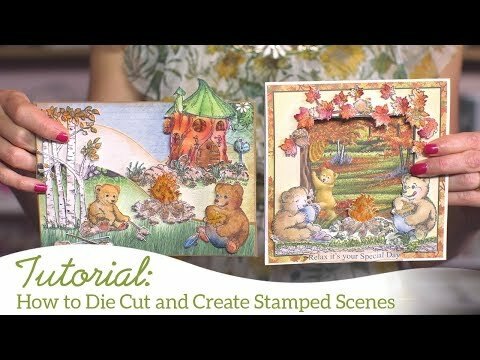 Use the same die to cut the border to match with card base. Then layer it directly onto the card base. Now cut the panel with green border and honey bear image to 5 1/4 x 4" size and diecut the edge with same border die. Sponge edges of panel with Tangelo ink and use dimensional adhesive to attach panel onto card base. Stamp the treehouse image from the HCPC-3798 Happy Time Treehouse, s'mores sticks from HCPC-3797 Beary Fun Retreat, aspen tree and set of trees from HCPC-3766 Woodsy Treescape stamp set in Tuxedo Black ink onto white cardstock and diecut with coordinating dies. Stamp the 'Relax' sentiment in same ink onto white cardstock and straight edge cut it apart into 2 strips as pictured. Use the Stack and Store daubers along with the following inks to color the images. Use a Dove Blender for blending and fine details. For the tree house roof use New Sprout, Olive Grove and Cantaloupe. For the rest of the tree house use Tangelo, Rhubarb Stalk and Cantaloupe. For the trees, use Tangelo, Rhubarb Stalk and Cantaloupe. Use Cantaloupe and Rich Cocoa on the tree trunks. For the grass use New Sprout, Olive Grove and Cantaloupe. Use Peanut Brittle on the s’mores sticks. Sponge edges of sentiment with New Sprout, Cantaloupe and Tangelo. Use an X-Acto knife to cut out the door of tree house and along the roof line. This will allow for more dimension. Before attaching tree house and trees, dab some Peanut Brittle onto card to create the illusion of ground where you’ll place them. Shape everything and use glue and dimensional adhesive to attach onto card as pictured. Use Dries Clear glue to add a touch of gold glitter onto card as desired.